Below is a list of multitrack projects which can be freely downloaded for mixing practice purposes. All these projects are presented as ZIP archives containing uncompressed WAV files (24-bit or 16-bit resolution and 44.1kHz sample rate). For maximum mixdown flexibility, the contributors have made every effort to provide audio 'raw', in other words without additional effects or processing (beyond treatments printed during tracking/editing). When importing the tracks, just make sure all the files start at exactly the same moment in time within your DAW's timeline. (Download problems?) In addition to the Full Multitrack packages, there are also many quick-download Edited Excerpt versions (usually featuring the song's biggest chorus) which provide 'bite-sized' mixing assignments well-suited to classroom use. In both cases a preview mix is provided for easy auditioning while browsing through the list. As well as the multitracks hosted directly on this site, I've also included links to a few other decent downloads I've discovered on other sites. If you have any projects of your own that you'd be willing to post (or link to) here, then do get in touch. This is a continuously expanding resource, so if you want to keep track of the latest uploads please subscribe to my monthly spam-free 'Small-studio Secrets News' mailing list -- I usually post towards the end of the month. Many thanks to the artists and engineers who have kindly agreed to provide these files -- please follow the links and check out their latest music! All downloads from this site are provided free of charge for educational purposes only, and the material contained in them should not be used for any commercial purpose without the express permission of the copyright holders. For projects hosted on other sites, please refer to their separate conditions of use. Share mixes, swap feedback, and get more info about the library's multitracks. Support them by clicking here. Full details of these sessions can be found on the Telefunken site here. Support the artists by clicking here. Support them by clicking here. Full details of this session can be found on the Telefunken site here. Support him by clicking here. Full details of this session can be found on the Telefunken site. Many thanks to Andrey Yaroshinky and Moscow's Gnessin Academy for supply these tracks. Support her by clicking here. Recorded from a live classical chamber-music concert on 18th December 2011. Support this ensemble by clicking here. As featured in this Mix Rescue article -- you can download my full Cockos Reaper project session for that remix here. Support the band by clicking here and here. As featured in this Mix Rescue article -- you can download my full Cockos Reaper project session for that remix here. Support them by clicking here. Support them by clicking here and here. Support them by clicking here. This session has been kindly provided by Telefunken as part of their Live From The Lab video series. Although these solo guitar instrumentals aren't really multitracks as such, they're still excellent mixing practice because of the incredibly wide range of playing techniques David uses, including complex rhythmic tapping techniques. Support him by clicking here. Support them by clicking here. The recording sessions for these tracks were featured in this Sound On Sound magazine 'Session Notes' article. Support him by clicking here -- he's interested in hearing any new mixes too! The song 'On The Line' was featured in this Mix Rescue article -- you can download my full Cockos Reaper project session for that remix here. Support him by clicking here -- he's interested in hearing any new mixes too! Support him by clicking here and here. As featured in this Mix Rescue article. Support them by clicking here. Support here by clicking here. Many thanks to Callum McGee Productions and the orchestra for supply these tracks. Many thanks to engineer Bill Rowse and the band for supplying these tracks! Support them by clicking here. This session has beeen kindly provided by Telefunken as part of their Live From The Lab video series. 'Dark Horses' was mixed by Damage Audio. 'Drag' was mixed by Mancave. Support them by becoming a patron and by clicking here and here. Support the band by clicking here. These recordings were kindly contributed by Grammy-nominated producer Stefano Amerio at Artesuono Recording Studio. Support them by clicking here. Full details of these sessions can be found on the Telefunken site here. As featured in this Mix Rescue article -- you can download my full Cockos Reaper project session for that remix here. Although this solo guitar instrumental isn't a multitrack as such, it's still excellent mixing practice because of the wide range of playing techniques Santi uses. Support him by clicking here. You can download my full Cockos Reaper project session for that remix here. 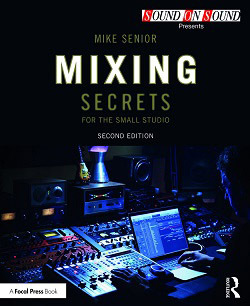 The recording and mixing of this multitrack were featured in these two articles: Session Notes December 2012 and Session Notes January 2013. Support the band by clicking here. The recording sessions for these tracks were featured in this Sound On Sound magazine 'Session Notes' article and the final album is available from iTunes. Support the band by clicking here. You can download my full Cockos Reaper project session for the song 'Wayfaring Stranger' here. Full details of the small-studio location recording setup used for 'Wayfaring Stranger' can be found on this page. The recording sessions for these tracks were featured in this Sound On Sound magazine 'Session Notes' article and the final album is available from iTunes. Support the band by clicking here. As featured in this Mix Rescue article. Support him by clicking here. As featured in this Mix Rescue article -- you can download my full Cockos Reaper project session for that remix here. Support him by clicking here. This recording was kindly contributed by Grammy-nominated producer Stefano Amerio at Artesuono Recording Studio. Full details of this session can be found on the Telefunken site. You can download my full Cockos Reaper project session for the song 'Air' here. Support the band by clicking here and here. Many thanks to Bravestar for contributing this multitrack. As featured in this Mix Rescue article. Support him by clicking here and here. Many thanks to the artist for contributing this project. Support her by clicking here and here. Support J P Lantieri by clicking here and here. Support Lektrix by clicking here. Support Ornery by clicking here. Support him by clicking here and here -- he's also interested in hearing creative remixes of this multitrack project! Support him (and hear his complete mix of this short story) by clicking here. Many thanks to Nahum Strickland for supplying these tracks! Support them by clicking here, here, and here. Support them by clicking here. These tracks were provided by Arthur Walwin as the basis of this Mixoff.org contest. This song was featured in a PureMix mixing competition. Support the artist by clicking here. Support her by clicking here. This session has been kindly provided by Telefunken as part of their Live From The Lab video series. Support them by clicking here and here . As featured in this pureMix mixing context. Support the band by clicking here. From the 2011 album 'The Greatest Narrators'. Support him by clicking here. As featured in this Mix Rescue article -- you can download my full Cockos Reaper project session for that remix here. Many thanks to Bruks for contributing this multitrack. Many thanks to the band for supplying these tracks! Full details of this session can be found on the Telefunken site here. Many thanks to Jules King for supplying these tracks! The song 'Come Around' was featured in this Mix Rescue article. Support them by clicking here. The recording sessions for this track were featured in this Session Notes article. Support her by clicking here. This multitrack has been kindly supplied by Audio Issues. Check out their Special Mix Tutorial For Home Studio Mixing Engineers, which features this project as a practical case-study. Many thanks to Remember December for contributing this multitrack. These multitracks were provided by Arthur Walwin for this Mixoff.org thread. Many thanks to Ronnie for contributing this multitrack. This project was recorded and produced by Joe Lonsdale at Joe Public Studios for his e-book 'Building The Band In The Bedroom'. As featured in this Mix Rescue article. Support her by clicking here. Support the band by clicking here. Support them by clicking here -- they're interested in hearing any new mixes too! As featured in this Mix Rescue article. Many thanks to The Black Bloc for contributing these multitracks. Thanks to Fernando Martinez for supplying this session. These multitracks were kindly provided by Discussion Zone member Marc Gosselin. Support him by clicking here. Many thanks to the staff and students of CEF Mallorca for contributing this multitrack. Support him by clicking here. This project was recorded and produced by Joe Lonsdale at Joe Public Studios for his e-book 'Building The Band In The Bedroom'. This song was also used as the basis for the Cambridge-MT Patrons 'Colour Me Red' Mix Contest. You can download my full Cockos Reaper project session for the song 'Sascha' here. The recording sessions for these tracks were featured in these two Session Notes articles: October 2012 & February 2013. Support the band by clicking here. From their forthcoming album -- support them by clicking here. Support him by clicking here. Full details of this session can be found on the Telefunken site here. Support him by clicking here. This session has been kindly provided by Telefunken as part of their Live From The Lab video series. As featured in this Mix Rescue article. You can download my full Steinberg Cubase project session for that remix here. Support them by clicking here, here, and here. As featured in this Mix Rescue article. The vocal production process for this song was the focus of Sound On Sound magazine's December 2014 'Session Notes' column. You can download my full Steinberg Cubase project session for that remix here. Support them by clicking here and here. As featured in this Mix Rescue article. Support them by clicking here and here. Many thanks to Salon 8 for supplying these tracks! Support the band by clicking here. Full details of this session can be found on the Telefunken site here. Support them by clicking here. 'Passing Ships' and 'Quicksand' are from their latest album, The Big Defreeze. Support them by clicking here. These sessions have been kindly provided by Telefunken as part of their Live From The Lab video series. Support them by clicking here. This recording was kindly contributed by Grammy-nominated producer Stefano Amerio at Artesuono Recording Studio. Support him by clicking here. This material was recorded and mixed at Tiny Telephone studios by renowned engineer Oz Fritz. Also, if you liked these projects, check out this stem-mixing session he's kindly provided for another excellent song of his, 'Poor Boy' (preview MP3 • 19 stems: 565MB ZIP). Support the band by clicking here and here. Support them by clicking here. This multitrack was provided as the basis of this Mixoff.org contest. Support them by clicking here. Full details of this session can be found on the Telefunken site. Support them by clicking here. They have also provided a processed stems for this project, if you'd like to experiment with stem mixing/mastering: (stems: 444MB ZIP). As featured in this Boz Digital Labs mixing contest. Support the band by clicking here. The recording sessions for these tracks were featured in these two Session Notes articles: April 2013 & August 2013. Support them by clicking here. Support Jet B and her band by clicking here. The song 'Promises & Lies' was featured in this Mix Rescue article. Support him by clicking here. These multitracks were originally provided for this Mixoff.org thread. As featured in this Mix Rescue article. Support the band by clicking here. This project was recorded, mixed, and mastered by Chernobyl Studios, and Scott explains the whole process in a series of dedicated video tutorials here. Transferred from the original analogue multitrack tape, recorded in 1975. New material from the band behind 'Revelations' and 'You Are The One' -- recorded forty years later with four of the six original band members. The song 'Facade' was featured in this Mix Rescue article -- you can download my full Cockos Reaper project session for that remix here. The song 'Blood To Bone' was used for The Great: 'Blood To Bone' Mixoff Competition, as well as for the SOS September 2011 'Top Ten Mix Mistakes' article. Support the band by clicking here, here, and here. Support Zane by clicking here. Full details of this session can be found on the Telefunken site. Support her by clicking here. Full details of this session can be found on the Telefunken site here. Many thanks to the band for contributing these multitracks. For all inquiries, please contact me direct. Unlike most of the other multitracks, these files have already been processed to create a decent balance immediately. However, everything's bone-dry, so the project is handy for experimenting with the sweetener effects discussed in Part 4 of the book.